Anyone who might have taken a particularly strong interest in the recent exhibition of the pottery of Okinawa at the Mizen Art Gallery is encouraged to send e-mail to us. They can receive the full catalog of pieces in that way. For now, though, it may be fruitful to examine a few pieces from the collection in order to get a better feel for this particular style. The Vase Tsuboya as archaeologists often refer it to is an excellent example of this style. 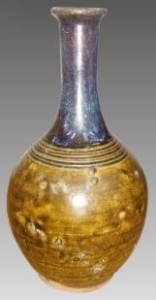 The glazing is quite unique, and offers a good strong contrast with the body of the vase being a metallic color that staunchly opposes the thin upper neck area. This Tsuboya vase is surprisingly diminutive, at only 18 x 9 centimeters. Many of these pieces are actually quite modern. 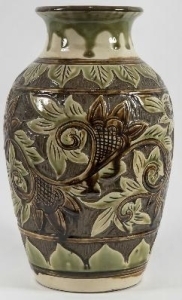 Take for instance the example of the vase that features a rather plant-themed design that Kobashigawa Eikoh made. The artist lived between 1911-1990, and much of his work was based on these sorts of motifs. In fact, this is another excellent example of the way that modern society has pushed artists into designing their work around anything but. Modernity isn’t something that always rears its intriguing head in these pieces, however. Tsuboya, for whom the pieces containing this name received it from in a sort of archaeological shorthand, is located on the island of Naha. Over a period of around 300 years the city distinguished itself in the field of ceramic art. Indeed, it could be said that ceramics constitutes the most unique art form of the Okinawan people. Okinawa has already been celebrated for its unique cultural heritage. The islands that make up the chain are situated between Kyushu, the Japanese prefecture and the island of Taiwan. It was this unusual geographical location that allowed a free exchange of ideas to flourish in the islands. Vegetative motifs are very much a part of Kobashigawa Eikoh’s (1911-1990) work. Approximately 6,600 years ago, earthenware pieces were first made in Okinawa. These ceramics were heavily influenced by work that was being made regularly in the Kyushu region. The island of Oukunoshima held a great deal of sway over artists there at the time, and Chinese ceramics also had been introduced during the Gusuku period (1100-1400). Importation of Chinese manufactured goods reached a zenith in the late 1400s when three kingdoms formed on the Great Ryuku territory. Chuzan occupied the central mountain area, while Hokuzan and Nanzan occupied the north and south respectively. Ultimately this unified the Ryukuan Kingdom. As one might expect this caused great shifts in the way that ceramic art was worked on in the islands.